Workstation Settings assign specific properties to an individual computer. To edit Workstation Settings from the menu bar of the main TeleTracker Online screen, click View, then Workstation Settings. Station # : Each Cash Drawer at a particular location will be assigned a unique Station #. Multiple computers may be assigned the same Station #, if they are taking and receiving payments from the same Cash Drawer. Use this field to assign the appropriate Station # to the computer. 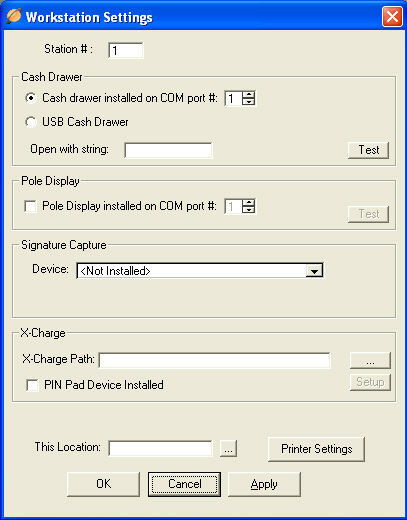 Cash Drawer Installed on COM port # : Select this radio button when installing a cash drawer with a 9-pin serial connection. Select the appropriate COM port to which the cash drawer is connected. For more information on purchasing a cash drawer, contact the TeleTracker Online Sales Department at 877-277-6810 extension 1. For additional information and options visit the APG Series 100 Cash Drawer help page. USB Cash Drawer : Select this radio button when installing a cash drawer with a USB connection. For additional information and options visit the APG Series 100 Cash Drawer help page. Open with string : In order for TeleTracker to 'pop' the cash drawer open, this field must be populated with the following, case-sensitive phrase: “OPEN”. Pole Display installed on COM port # : When a pole display is installed on the computer, select the checkbox and the appropriate COM port to which the pole display is connected. For more information on purchasing a pole display, contact the TeleTracker Online Sales Department at 877-277-6810 ext. 1. For additional information and options, visit the PD3000UP USB Pole Display hep page. Device : When a signature capture pad is installed on the computer, select the proper device from the drop-down menu. Pin Pad Device Installed : This box needs to be checked when there is a pin pad device installed on the computer. This Location : Assign the appropriate location to this workstation. This property will be used in various security functions, such the Location Restrictions found in the Users Master File. The Printer Settings button will enable you to specify printer settings on an individual workstation basis. 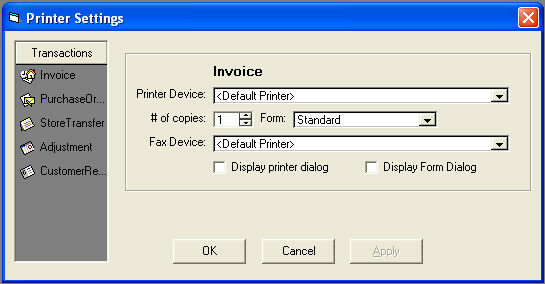 Click the appropriate transaction to specify the printer settings, such as # of copies or Printer Device, etc.